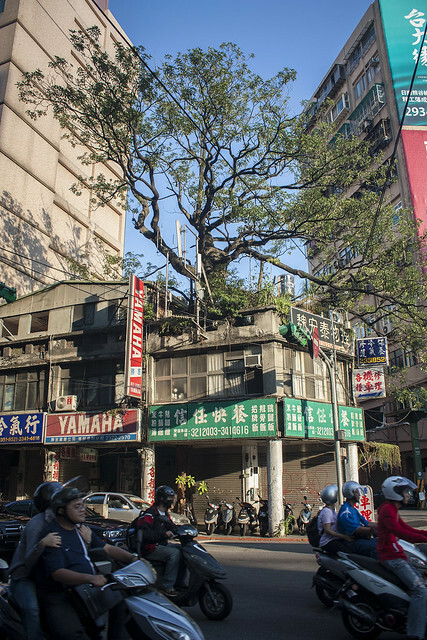 A couple of months ago, I wrote about the fig tree that has taken root atop a dilapidated building on Temple Street in Hong Kong. 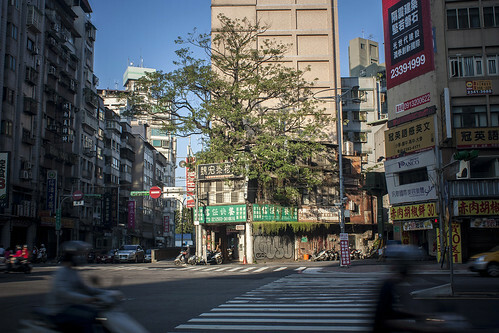 800 kilometres to the northeast, across the Taiwan Strait, there is something even more spectacular: an enormous tree that grows straight through an otherwise ordinary shophouse. You can find the tree on Roosevelt Road, a wide boulevard that runs through the heart of Taipei, from the Chiang Kai-shek Memorial Hall to some of the city’s largest universities. From afar, it looks as though the tree stands in a courtyard, but walk closer and you’ll find its trunk rooted in an adjacent sidewalk. It rises up through the building’s first floor, curves through the interior and explodes past the roof into a riot of foliage. What came first, the building or the tree? Either way, accommodating the tree would have required serious effort and expense on the part of the building’s owner. It goes without saying that cities impose themselves rather heavily on nature. Manhattan was verdant and hilly when the Dutch arrived; now it is flat and stripped bare of nearly all primeval forest — even Central Park is a simulacrum, its landscape meticulously planned by Frederick Law Olmstead. Even recent efforts at urban greening — vertical gardens, rooftop farms — stop short of being truly transformative. So it’s especially interesting to see a piece of the city adapt to nature rather than the other way around. When Hong Kong’s Pacific Place shopping mall was built in the 1980s, a small fortune was spent to preserve a century-old banyan tree that stood on the site. More modest in scale are the fruit trees of New York, which have been incorporated into buildings by Orthodox Jews, who are forbidden from chopping them down. Twenty years ago, newspapers reported the phenomenon. In our conversations, we say, ‘That’s the tree, that’s the tree.’ But we never give it much thought. That is, did the tree come first, or was the house built around it? Or was there originally some distance between the tree and the house, and later the tree grew into the house and became an inseparable part of it? The interesting thing is, why wasn’t the tree chopped down? 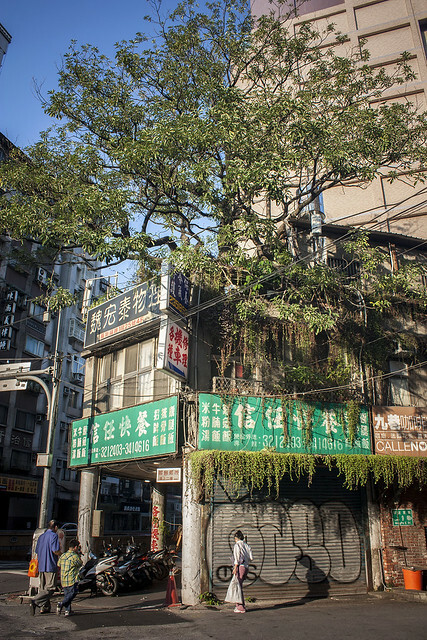 In such a situation, Taipei residents would usually keep the house instead of the tree. This is a strange Taipei phenomenon. It is a symbol of Taipei. The life of the tree, how it came to be, and whether it is legal or not to have a tree puncture a building are not important at all. The important thing is that it exists, and it has existed for decades. “It exists, and it has existed for decades.” That seems like a very Taiwanese way of seeing things. But really, what else is there to know? The tree is the building; the building is the tree. 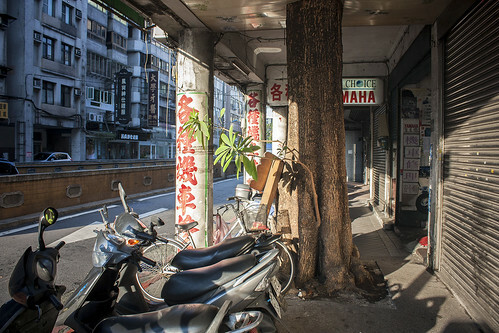 This entry was written by Christopher DeWolf , posted on Wednesday January 02 2013at 07:01 am , filed under Architecture, Asia Pacific, Environment, Heritage and Preservation and tagged Exploring the City, Taipei, Taiwan, Trees . Bookmark the permalink . Post a comment below or leave a trackback: Trackback URL. Saw it often when I lived in Taipei. Didn’t think twice about it, it just seemed typical Taipei.